One of the loveliest locations in the entire nation is a heartbeat away from the city of Chicago. I've been to Door County before, so its beauty was not a surprise to my eyes. Last week, I drove up to Door County and the scenery is quite a spectacle. Driving onto the Door County Peninsula one is surrounded by the glories of Lake Michigan on both sides of your ride. I will admit to this and it's a tough thing to admit to, but my brother-in-law (who is a die-hard Chicago Bears fan) insisted on stopping at Lambeau Field in Green Bay. Go figure, but I did have my photograph taken with the gigantic Vince Lombardi statue. The statue doesn't look like Lombardi, but it does look a great deal like the late (long late) actor, Wallace Beery. Unless you are a film buff (I am) or you are over 80 years old (I'm not) you might have to look him up. Take my word for it, this statue looks like Wallace Beery. Even as a Chicago Bears fan, you can have lots of respect for the late Coach Lombardi. After looking online for several days I managed to come up with a few locations I thought would provide a pleasant couple of nights in Door County, but then it dawned on me that I recently had been around an old friend who goes up there almost every year, so I made it easy on myself and I asked her for a recommendation. Her recommendation was to stay at the High Point Inn and I did. The High Point Inn is centrally located in Ephraim (not in the town's center, but close enough), which is smack dab in the middle of Door County. The High Point Inn is a lovely property. It has great curb appeal, excellent customer service and a clean and livable room! I would stay there again and that's always a high praise compliment. Three other people were in my party and we stayed in a two bedroom suite with two bathrooms. Private and quiet as well. The price was quite reasonable. While in Door County we ate at two respectable breakfast eateries. Both the Summer Kitchen and Carroll House were good choices for eggs, etc... I love to support small businesses whenever I can, so it's a treat to go to these locations. The drive around the entire County is a wonderful experience and if you intend to only do this once in a lifetime, then enjoy every frame of it. Ephraim, Egg Harbor, Fish Creek, Sister Bay are all gorgeous small towns along the water of Door County. Door County is a quirk of topography - 70 miles - north/south! There is some jaw dropping scenery on this peninsula. If you don't want to drive around, although you will enjoy every moment, there are plenty of boat excursions to take you around. One of the best restaurants in Door County is the Gibraltar Grill. Excellent meal. Quite honestly, you couldn't get a better meal at a restaurant in the city and by that I do mean, Chicago. Outstanding food and service. 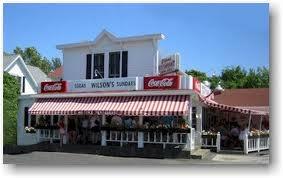 Wilson's has been in existence in one way or another for a hundred years. It's a classic in more ways than one. Classic decor, but more importantly, the ice cream is creamy and superb. It rivals any great ice cream parlor in America, including Illinois' own, Oberweis Dairy. Make this a must stop on your trip to Door County. Prices are beyond reasonable. Nothing could possibly beat the sun setting along the shore of Ephraim. When you exit Wilson's you will be treated to a sight beyond sights. Every three to four minutes you will get another amazingly wow of a sight as the colors change along the skyscape. Picture perfect! Peninsula State Park is a stunningly beautiful state park and it offers a wide variety of trails, so take advantage of those trails. Many are difficult on rugged terrain, but there are a few for the light of heart and easy of feet. The Lighthouse in the Peninsula State Park is another must see while in Door County and you can drive around the Park as well as enjoy it by foot or bike. There are 20 miles of hiking trails and 20 miles of bike trails. The Eagle Bluff Lighthouse has been there since 1868 and the tower gives you a 180 view of the park and the surrounding area. There are a wide variety of shops and boutiques in Door County, but two standouts are the two Christmas stores. The Mistletoe Holiday House in Egg Harbor not only offers a wide variety of unique items (I purchased two items), but the proprietor is a lovely woman who serves up an ornament as a bag tie. The other Christmas store is the Tannenbaum Holiday Shop in Sister Bay. Both stores are musts for the shopper and non-shopper alike. Two other must see places - Cave Point and the Old Rugged Cross. Cave Point is stunning and it's in a County Park, so it is not necessarily going to be heavily promoted like a State or National Park. Cave Point is located in the Sturgeon Bay area. Also, George Bennard wrote the inspirational hymn, "The Old Rugged Cross" in 1913 and an old rugged cross is on display at Friends Church in Sturgeon Bay. For those who believe in the saving power of the Cross, this will be a highlight on a trip to Door County! Bennard was from this part of the country. Travel to the northernmost tip of the peninsula and take in Washington Island for a further adventure on your painted journey! Door County is beautiful during all four seasons, but much of the County is closed down during the winter months, but a hearty soul can travel up there and find a place to stay and things to do. Galleries, lighthouses, state and county parks, boat rides, and don't forget the famed fish boils. Go to Door County!